Anything you can do to make yourself stand out in today’s competitive graduate recruitment market is a plus. A lot of Exeter students recognise this, which is why we’ve already had 1900 sign-up to do the Exeter Award since the start of the academic year. If you’re already up and running with the Award, now’s a good to time to plan to complete it before the summer. We run the key sessions right though the summer term to help you achieve this and if you are leaving the University this year it will help you get ahead of the 300,000 other graduates entering the job market. On the other hand, if you are a returning student, why not go for gold and do the Exeter Leaders Award as well? Find out more on the Exeter Award and Exeter Leaders Award websites. Are you struggling through a dry January? Or are you trying to lose weight? Give up coffee? Sugar? Chocolate perhaps? Why not make a far less painful New Year’s resolution and aim to complete your Exeter Award in 2015! 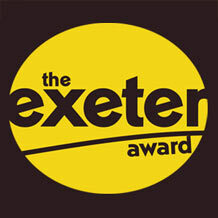 The Exeter Award is an achievement award designed to give you recognition for the extra-curricular activities that you take part in whilst you’re a student here at Exeter. It’s a fairly easy way to really beef up your CV. You’ll need to attend a few skills sessions and gain some work experience, but there’s a good chance you’ve already taken part in some activities that you can count towards attaining the award, so you might already be halfway there! The diagram below shows the steps you need to go through to complete the Award. You can see a larger version and find more information on the Exeter Award website. Completing the Exeter Award is managed entirely through My Career Zone, this is where you will register to take part, sign up for events and track your progress. When you login click on the Exeter Award box in the centre of the screen to access your profile. Your Exeter Award profile provides links to the different activities you can count towards your Exeter Award, including events your College might be running. Once you know which skills sessions or events you would like to attend – book your place via My Career Zone and put it in your diary. When you attend and scan-in this will automatically update on your award profile in My Career Zone: Magic! Not sure what to do for the work experience element of the Exeter Award? You can count any paid work experience or any voluntary work undertaken since starting at the University. You can see what other students have done by following the links above. If you have a question about the Exeter Award, someone else has probably asked it too, we have lots of Exeter Award FAQs for you to look at. You can also find out more about the different elements of the Exeter Award on the Exeter Award webpages. 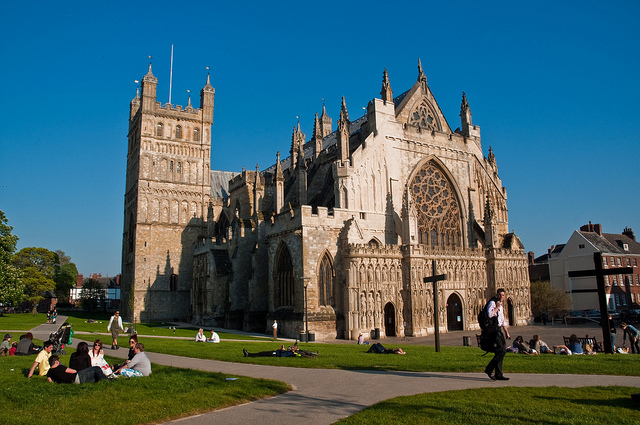 Over 350 students completed their Exeter Award last year – will you be completing yours in 2015? Previous students of the University can be an incredibly useful resource when it comes to researching possible career paths. They were, after all, in your shoes once and they can impart invaluable insights into that great unknown; what on earth happens after graduation? We have 3 ways you can access alumni to discover what particular industries or jobs are actually like to work in and how to get that all important first foot on the ladder. 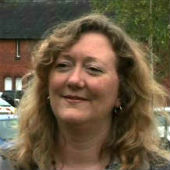 We’ve been gathering various alumni profiles and organised them by College on our website. Our alumni write about what they’ve done in their careers to date, give industry insights and their top-tips to current students about employability. This is a growing resource that we aim to make more comprehensive in the coming months, but there are some golden nuggets of advice in there regardless of which discipline you are studying. Take a look at our alumni profiles. Our Career Mentor Scheme is a unique opportunity for you to be matched with an experienced professional to gain one-to-one careers advice, support and guidance into their profession and sector for up to 6-months. Mentors come from all types of industries and are at various stages in their careers. You might meet up with them on occasion or communicate via email or telephone to pick their brains. If you make the most of this opportunity you’ll gain a realistic insight into a profession and develop personal and professional competencies which will set you apart from other students and graduates and you may even gain other networking opportunities from taking part. It will be a great addition to your CV. Applications for the Spring to Summer Scheme open 26 January 2015. 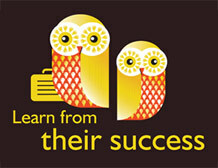 Find more information on our Career Mentor Scheme web pages. 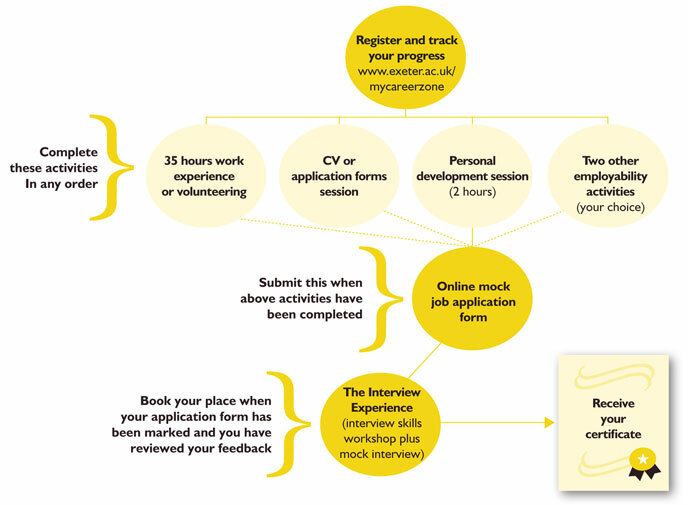 Our eXepert Scheme can provide you with the opportunity to contact University of Exeter alumni to gain advice on how to enter your chosen sector, work for a certain company, become self-employed or benefit from possible networking opportunities and contacts. These tend to be a one-off email exchange where you ask specific questions. We have a large pool of alumni who have offered support to students and graduates. As our alumni are based all over the world (including entrepreneurs) and cover a huge range of sectors we are likely to find someone who can offer you an insight into their professional experience and offer advice to help you make informed career decisions. Find more information on our eXepert Scheme web pages. The Presentation of Self in Everyday Life. That has to be my favourite book title. That and Thomas Hardy’s short stories collection “Life’s Little Ironies”. If you have read Hardy then you will appreciate the bitter humour. The title was so good, I couldn’t bring myself the read the book; the book surely couldn’t live up to it. Erving Goffman was a renowned academic and was one of the first to apply an almost forensic analysis to everyday interactions and this theme was developed in his The Presentation of Life in Everyday Life (1959). The everyday is the important part. We all are aware that we put on a bit of a show for “special” events such as interviews or formal presentations but his take was that we do this all the time to preserve our status and limit damage to our self-esteem. I remember Goffman’s book being deeply serious and at the same time being seriously hilarious. I hope if you decide to read it, so do you. Harvard Professor Amy Cuddy has done some interesting research on it: TED Talk: Amy Cuddy – Your body language shapes who you are. It is a longish clip but you may find what is contained in there could be useful before that formal presentation or interview. You can access other help for those tricky presentations in My Career Zone. Her research shows that body language can affect the levels of the hormones testosterone and cortisol in your body. Testosterone is the one you want to have at a higher level: it makes you feel more powerful. Cortisol is seen as the “stress” hormone. She recommends that before a formal event, for two minutes, you adopt one or two of the power postures. Hands raised, hands on hips, BIG postures. I tried this out before a particularly nerve wracking session in Newman A. I went to the toilet opposite the Sanctuary, the one that has a constant smell of asparagus. I did a few power postures. I was particularly fond of what I named the “Mussolini”: hands on hips, jaw protruding forward and striding around the room with long, loping steps. Luckily no one came in. It seemed to work and when I arrived for my five minute input to a lecture and it turned out I was doing the whole hour, I somehow survived. But I have a doubt. What if you fake it and put on a face which is not yours? Do you become a different person? Do you start playing a role which is no longer you or true to your values, to the person you used to be? If it is true, in my book, that’s a little irony. So as a second year student you are no longer the newbie! You know where to find the books you need in the library, the shortcuts across campus and the best places to go in the evening. While you’re getting to know yourself better; your strengths and weaknesses, your approaches to work and the types of tasks you enjoy, you may also be applying your self-awareness to what you might want to do when you graduate. If you haven’t already checked out your subject page on our website or dug around Prospects and TargetJobs to get some basic understanding of what opportunities are available to you, then now’s the time to start. 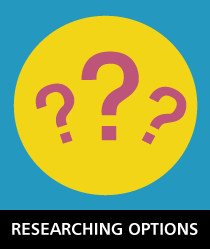 Research helps you to clarify what particular occupations actually do and which skills and networks you should be focussing on. Meeting with a Careers Consultant may be helpful at this point; just to bounce some ideas around and organise how you are going to test career choices over the coming year. Give yourself enough time to do a really effective application. Aim for quality rather than quantity! Consider regional as well as head office opportunities which often struggle to fill their places! As a Plan B, consider working in an administrative role in the organisation you would really like to work for, as a way of developing contacts for graduate applications later on. The Fame Database holds information on 3.8 million companies in the UK and Ireland which can be filtered by postal region, number of employees and industry type to identify possible companies that you may want to research further and contact direct for work experience. Get as much help as you can! Make sure your friends and family are really clear about what you are looking for so that they can network on your behalf. It’s competitive and there are no guarantees, but by researching which roles could bring your dreams alive, and by learning how to articulate what you can offer to employers, you will not only be in with a good chance of acquiring valuable work experience, you will also be gaining essential skills from the process itself, which will greatly support you in whichever career you aim for in the future! What on earth is eXfactor? The name alone could be enough to put anyone off, conjuring images of pub karaoke and drink fuelled versions of Wonder Wall. You might contribute to a presentation at our eXfactor but this is altogether a different approach to demonstrating your talents. eXfactor is a one day program for all year one students, introducing them to the essentials of employability and careers in a relaxed and friendly environment. Gone are the days of falling out of Exeter into the arms of your dream employer in your final year. Recruiters expect a great deal and it helps to start understanding your potential in relation to the opportunities with your subject early. This can enable you to make informed decisions about your future and how you pursue this through an application process. The course is tutored by experienced trainers and Exeter careers consultants offering a mixture of employment knowledge and experience. It’s all about you and your skills and how you would like to develop during your time at Exeter. Most employers will recruit graduates of any discipline but want to see concrete evidence of skills and qualities. 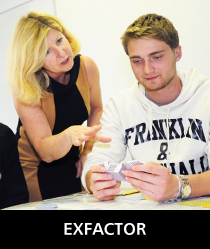 EXfactor gets you thinking about skills, activities at Exeter and the next stage. You will work in small groups on a number of tasks and learn more about employability support at Exeter. You will start to think about the career timeline, “emotional intelligence” and amaze your friends and family with your networking genius. We cannot promise eXfactor will land you that perfect job or postgraduate course but active participation in the course and further action could be the basis for your successful graduate future and managing your meteoric career. Visit the eXfactor web page to find out more. Yes, it will be hard work at times but enjoy everything the University has to offer. We want you to be happy here. J.K Rowling studied here and based Diagon Alley on Gandy Street in Exeter. I believe there is a slightly grander version at Universal studios, Florida. 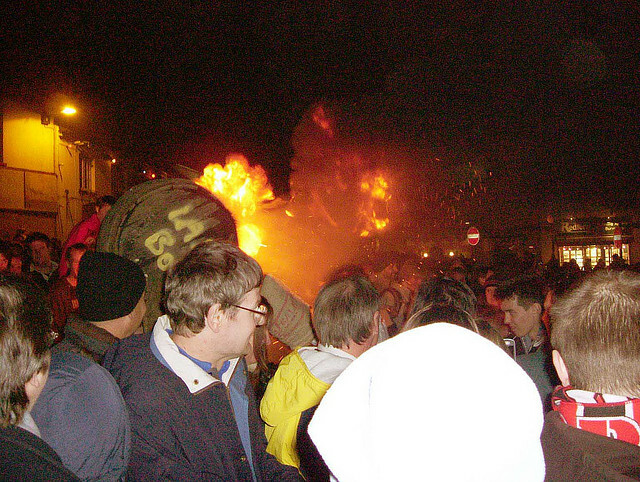 If you were brought up on Harry Potter, you may notice local names that sound familiar. It’s Devon’s version of running with the bulls. You enter the village at your own risk. I did it once and still wake up screaming. A legendary bar/nightclub in Exeter and no one really knows why. 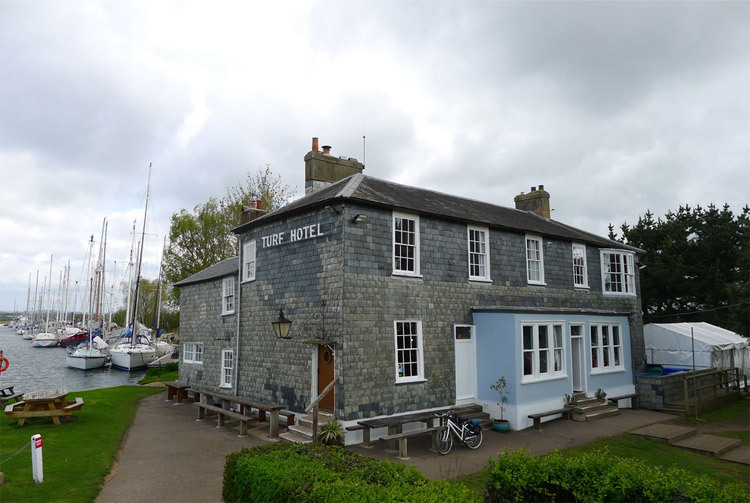 A splendid pub on the estuary. 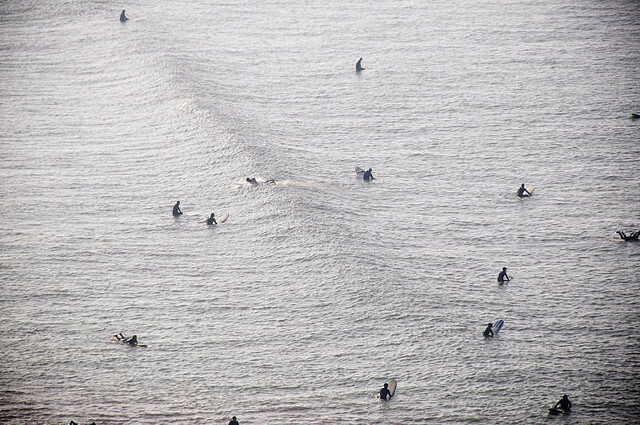 If you are feeling adventurous, cycle down to Dawlish too and see the black swans. You can hire bikes on the Quay. There’s sand and seaside stuff going on there. It’s a ‘spoons. It is cheap. It’s cheerful. The window in the Orangery was designed by Isambard Kingdom Brunel. 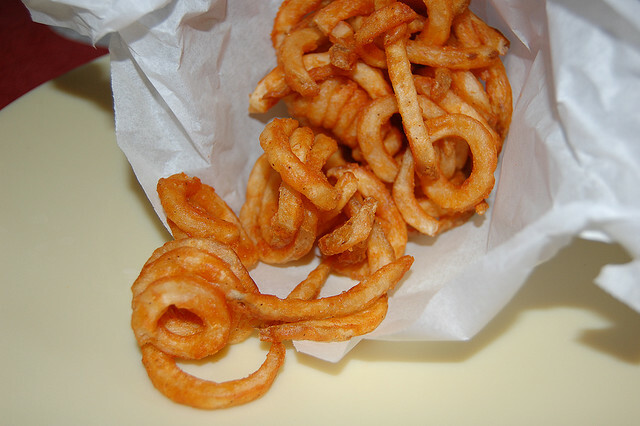 All hell broke loose a couple of years ago when they were taken off the Ram Bar menu. Not the bar but the Royal Albert Memorial Museum. Museum of the year 2012. Go see Gerald the Giraffe. We like him. Sometimes in life it is the simple pleasures that hit the mark. Keep your eye on the seagulls. They like picnicking on Cathedral Green too. It feels like a different city. I know I have said that but it is worth repeating. By the Career Zone team. We love My Career Zone! For everything employability related it has to be your first port of call. 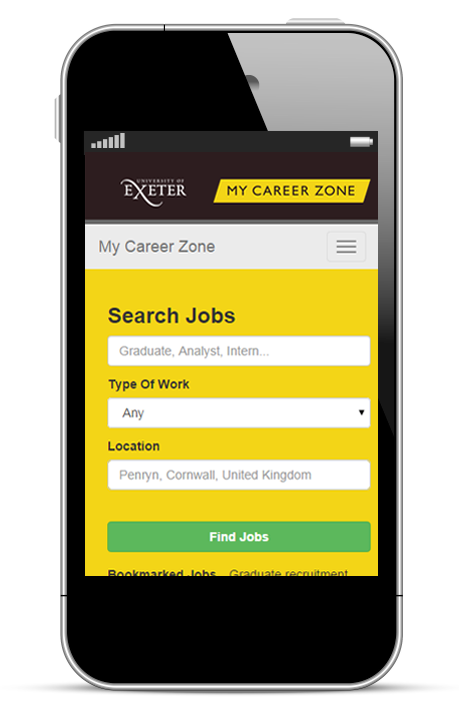 You can access My Career Zone through the student portal, in the iExeter smartphone app or by going directly to www.exeter.ac.uk/mycareerzone. Over the summer, we’ve been working hard on a number of improvements. So whether you’re a Fresher or a seasoned soon-to-be graduate, there’s a lot to take in. The start of term is just around the corner – so why not give yourself a head start and look for casual work now? After all, nobody wants to be juggling essays and application forms at the same time. My Career Zone is brimming with casual jobs and internship opportunities and it’s easier than ever to find them. When you’re searching, choose “Casual / part time / vacation work” from the type of work list. Found one you like? It’s easy to bookmark it and come back to it later. Have you heard of the Exeter Award? Our achievement award is for undergraduate and taught postgraduate students, it’s a great way to help you stand out from the crowd. 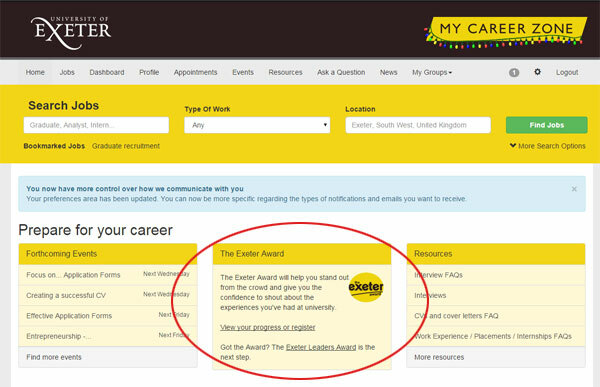 From your My Career Zone dashboard, it’s easy to track your Exeter Award progress and see your next steps. We’ll show you reminders for your booked skills sessions, so you always know what’s coming up, and it’s easy to look back at your booking history and consultation notes and see what you’ve done so far. Over the summer, we’ve added more information than ever onto My Career Zone. Whether you want a factsheet to help with an application form or a copy of the slides from your last skills session, everything is here and easily searchable. There’s more than jobs in My Career Zone. Want to know whether a particular industry is for you? We can put you in touch with an experienced professional for one-to-one guidance and advice. Search My Career Zone for Mentoring Opportunities. Follow the employers you care about, and we’ll notify you when they advertise new jobs or come onto campus for careers fairs and workshops. And the best thing of all? My Career Zone is now completely mobile-friendly – so whether you want to get guidance on the go, browse opportunities on the bus, or search for skills sessions after a seminar, we’ve got you covered. Set your preferences today and take the improved My Career Zone for a spin. It is that time when we are reaching the end of the academic year. A final flurry of exam stress and there, for finalists, your university life is over. The first line is quote from a lyric of an American songwriter whose work I like. Another similar quote is “Every new beginning comes from some other beginning’s end.” That one is from the Roman Philosopher Seneca the Younger, according to Wikipedia. Ahem, and we a research university. I first heard it in song called “Closing time” by Semisonic late in the last century (have a listen below). This song was also used in the Simpsons TV series. It was a dating song for Homer and Marge. Ahem. We careers advisers like to talk about “transitions”. It is the bit between one settled period of your life, where you know what you are doing, to another settled period. An ending and a beginning. An odd, exciting but unsure period. Our first years will have made a major transition to university. Some will have sailed through this period of change, some will have winged it and for some it has been a bit of a roller-coaster ride. Our second years will, in the main, be in that settled period. Our finalists will be entering one of the major transitions in life, leaving education and entering the world of work. Goodness. Where does the time go? We are here to help all students with these “transitions” from the first year undergraduates to PHD students and even the postdocs. We offer help in many ways. Whether it is deciding what to do, help with your plans, how to get an internship or advising you on your CV and applications. 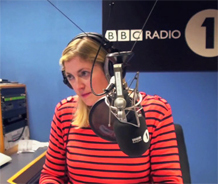 Find out more on the Career Zone website. What many do not realise is that we help graduates and postgraduates up to three years after they have left university. In person, if you are around. By email, by phone, by SKYPE if you are not. I have to rush. The blog editor, Andy Morgan, is standing over my shoulder and telling me I have to wrap this up and meet my deadline. But that’s fine. I have known how to finish this from the start. And, dear Reader, you probably have already guessed how this would all finish. Student Traders is one of the University’s latest projects. But what exactly is it? How can it benefit you? And most importantly, how can you get involved? The Student Traders team answer these questions and give an insight into the initiative. The Student Traders website is for students who are currently studying at Exeter and for students who graduated up to three years ago, to showcase and advertise their businesses, products, community skilled services and trades. It has primarily been designed to provide a FREE advertising platform for students who want to find employment through their extra-curricular skills. This means that you can effectively create a stream of income for yourself whilst you study, just from doing what you love and what you’re good at. Student Traders isn’t just limited to extra-curricular based skills though, if you’re a budding entrepreneur then we could help you too. We already promote a range of businesses on our website from student run clothing companies to homemade poetry CD’s. Keep checking up on our site as we will be introducing new businesses and trades all the time and we also have some exciting events in the pipeline. We are really open to feedback so please do get in touch with us if you have any comments or if you would like to find out more.